Today on Ellen, Kanye West premiered his new video for "Bound 2" off Yeezus. I still remember the first time I saw the video for "All Falls Down." It was 2004 and I&apos;d only vaguely heard about Kanye West, but, once the video began, I had to keep watching — the visuals themselves were so captivating. The first-person perspective was brilliantly done, and even that weird sequence through the x-ray machine was kind of awesome. 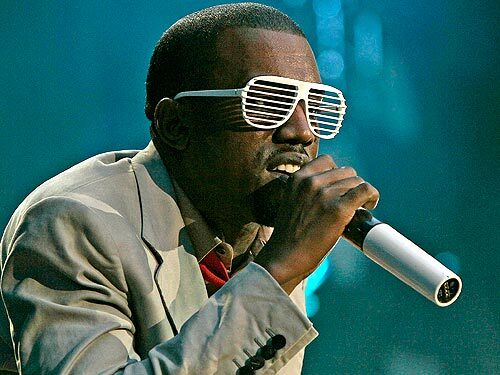 In the following years, we saw Yeezy bring out increasingly memorable, fun, cool, batshit, arresting, and fantastic videos for his hit singles. The images that Kanye created for his songs became one with the music — you can&apos;t think of "Stronger" without thinking of those shutter shades. This climaxed with 2010&apos;s stunningly gorgeous "Runaway" short film, cementing Yeezy as not only a sonic genius, but also a masterful visual creator. So you&apos;ll have to forgive me for having high expectations for the "Bound 2" music video. The premiere of the video comes on the heels of Kanye&apos;s speech at the Harvard Graduate School of Design. There, he spoke of the importance of creativity and design — how these things can change and sculpt the world into a better place. But it doesn&apos;t look like he put much of those concepts into the "Bound 2" video. Instead, it resembles something a teenage aspiring rapper made in his basement after getting his first girlfriend and borrowing a buddy&apos;s motorcycle. The video is cringe-worthy and depth-less, the complete opposite of what we&apos;ve come to expect from Kanye over the past decade. This single is one of the best off Yeezus, and certainly the most radio-friendly; it deserves sick visuals. Instead, it got Kanye reminding people that his girlfriend is hot. Yeezus has been a build-up of fabulous visuals. It kicked off with national projections of Kanye performing "New Slaves," in addition to his awesome performance of the song on SNL. Then, at the VMAs, Kanye performed a stark rendition of the soul-stopping "Blood On The Leaves," which was brilliant in its subtlety. He sang in darkness — recalling Billie Holiday&apos;s live performances of "Strange Fruit," which she sang in darkness with a single spotlight — lit by an image of a lynching tree. Meanwhile, we hear more every month about Kanye&apos;s concepts about style and self-presentation. Watching this video, all I could think was: what happened? Is this some sort of Warholian joke to see if we&apos;ll praise it as great art? Or did Kanye seriously just lose his groove for a minute?